What does it mean to truly understand the history of the Merrimack River watershed? Is it enough to see how the rivers powered the mills that Lowell was built around? Or should students study the conflict between the National Park and the hydroelectric company Enol over the future of the historic dam at the Pawtucket Falls? Is it more important to know that hundreds of years before the power canals were dug through Lowell, the Penacook used the falls as a yearly gathering place? Or must students study the history of the waterways themselves, and learn how sediment in lakes and rivers contains its own records? For students in the high school course, “The Merrimack: The Natural Setting and History,” all of these questions played a part in a semester spent mapping the meaning of the Merrimack to our region. Students came to see that just as you couldn’t study the history of people in this region without understanding the impact of the river, you couldn’t study the waterways without understanding the impact of people. Science teacher Katharine Hinkle first had the idea for the elective class when she was putting together an endersession last year. In the endersession, called “A Week Along the Merrimack and Concord,” students took to the waterways in canoes and kayaks and followed the path taken by Henry David Thoreau along the local rivers 175 years ago. 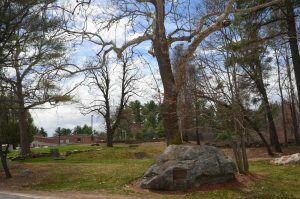 As students did so, Hinkle found herself not only helping students understand Thoreau’s view of nature, but also teaching them about geology, ecology, and local history. For students, many of whom had never given a second thought to the river that shapes our region, paddling the waters was eye‑opening. Hinkle wanted to spend a semester building on that learning, but she knew doing so would not fit cleanly in any one discipline. So, in the Spring of 2014, with the support of head‑of‑school Greg Orpen, she teamed up with history teacher Caitlin Sullivan and began planning a course that would trace the Merrimack river through space and time. They pided the course into four major units moving back through time, and challenged students to ask questions that crossed traditional disciplinary lines. 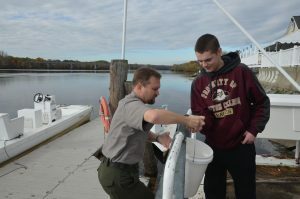 Students worked with the National Park to do water quality testing as part of their study of the current day Merrimack River. In a unit on land use in the colonial period, for example, students began by learning about the conflict between the Puritans, who saw in the region a wilderness to be tamed, and the Penacook and other peoples, who had lived and gathered along the Merrimack for hundreds of years. Though students had read extensively about the way Europeans had cleared and settled the land, for many, the impact of that settlement didn?t sink in until they saw it in scientific data. In studying the geological history of the area, students had used glacial varves, sediment layers from glacial runoff, to date local lakes. Later, looking at pollen deposits in sediment records, students saw how the impact of deforestation on local waterways showed up in the geological record, and could be used to date European settlement in the area.dents had read extensively about the way Europeans had cleared and settled the land, for many, the impact of that settlement didn’t sink in until they saw it in scientific data. For many students, it was surprising simply to learn how much of a role the Merrimack River plays in shaping areas they’ve known their whole lives. The foundation of the Tyng Mansion is visible just beyond the high school parking lot. For some students, just the fact that they can connect what they’re learning to their environment improves engagement. Students explained that since beginning the course, they find themselves talking to their friends and families about the landscape around them. Learning about the history of people in the area wasn’t limited to the city, though. It started literally just outside the classroom. Within a hundred yards of the the school building sits the foundation of the Tyng mansion, a site inhabited since 1668. 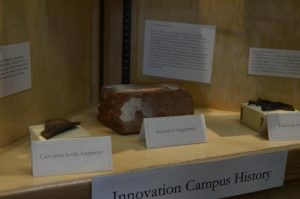 A display case houses artifacts found in archeological digs on campus. In the 1980’s, archeologists at Boston University conducted a dig at the Tyng Mansion site. 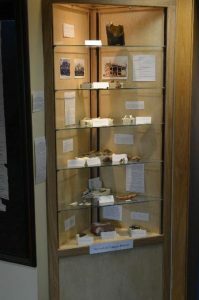 Sullivan arranged with the Robert S. Peabody Museum, which now houses the artifacts, to visit the classroom and show students the artifacts found on campus. That experience inspired Sullivan and Hinkle to have students do a dig of their own.ory of people in the area wasn’t limited to the city, though. It started literally just outside the classroom. Within a hundred yards of the the school building sits the foundation of the Tyng mansion, a site inhabited since 1668. 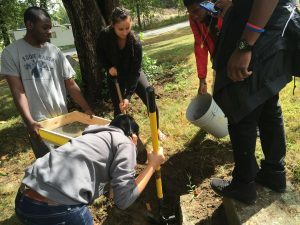 Within a week of the visit from archeologists, students were staking out dig sites on campus and sifting for artifacts. In the layers, students could see how this land was used centuries ago, in everything from cow teeth they dug up to pottery the Tyng family would have used. Hinkle and Sullivan were thrilled to see students were not only able to hold history in their hands, but literally to unearth it themselves. Arthur Potter’s group had learned that the key to archeology is understanding where people throw their trash. “We learned you’ll find a lot of things near rock walls and at the bottoms of slopes, because that’s where they’d throw their trash,” he said. “So we found a rock wall at the bottom of a slope and we started digging.” That’s where his group found pieces of a horse‑drawn sled. They excavated sections of the sled, but left more for future classes. “There’s still more down there,” Potter noted. When it came to the work on the school site, the class was supported by the IACS facilities team. Collin Kennedy, who has worked at the property since before IACS relocated here and is also a local history buff, joined the class to help with the archeological digs, as well as to show them local historical landmarks. Students found nails, pottery fragments, bits of pipes, and clay bricks.